2. Matthew 24 and 25 speak only of the fall of the Jewish commonwealth in AD 70 (Hansen affirms, Webster denies). It became quickly evident that Jack Hansen was leaning towards full preterism (the stance that all passages which speak of the end of the world/age are referring to the end of the Jewish world/age). But by the time the debate had ended, Hansen rejected that position (while still maintaining that there is no division in Matthew 24). The issues debated in this book are ones which are still present in the Lord’s church today, nearly 40 years later. This debate, like so many others, had times where it devolved to a “he said, he said” contest, but if you are willing to read past those petty parts, there is some great information on both sides to be gleaned in this book. I believe that you will find information worth considering in this book, regardless of which position you take in regards to the dividing of Matthew 24 and 25. As always, this book has been completely reformatted and edited to give you the best possible reading experience. We’ve not been just twiddling our thumbs around here. We’ve been getting more books ready for the Jimmie Beller Memorial eLibrary! Click the link below to read or download it! The second book we’re bringing you is a 12-page work entitled “The Act, Subjects, and Design of Baptism” by James Anderson, a preacher from Australia. While it’s short, it has a lot of really great information in it. And finally, we’re happy to announce that we’ve included T.W. Brents’ classic work, “The Gospel Plan of Salvation.” You’ll definitely want to get this one and read it. Click on the link below to read or download it! While we’re trying to get more work done on our book on the apostles of the Bible, we thought we would add some more books to the Jimmie Beller Memorial eLibrary. It is a good basic book on apologetics. As always, this book has been edited, corrected, and formatted for your reading pleasure! Just click the link to download this book or to read it online. And they go on and on. It is a collection of sermons dealing with misconceptions about the church, put into print so that people can have a better understanding of it. And today, it is free for you to download, courtesy of the Jimmie Beller Memorial eLibrary. The Name “Christian”— Is It A Presumption? “Dangerous Doctrines”— Do We Teach Them? Simply click on the link below to read it or download it to your computer for reading later! D.R. Dungan is best known for his enduring book, “Hermeneutics,” which is still a standard textbook in the study of biblical interpretation, even though it was written over a hundred years ago. But that’s not the only book that he wrote. The report of this speech in the Chicago Tribune of March 24th, has laugh­ter eighty-one times; frequently it is preced­ed by such words as “continued,” “renew­ed,” “great,” “prolonged,” “uproarious.” Applause also occurs twelve times. Mr. Ingersoll is a most extraordinary man. His wit is sparkling and original; his invective is withering, and the undercurrent of blasphemy hisses through almost every paragraph; his humor protrudes, and if ever put on the background comes to the front again on the slightest provocation. He is reckless in his statements; he is irreverent —not to say impudent—in his treatment of believers. 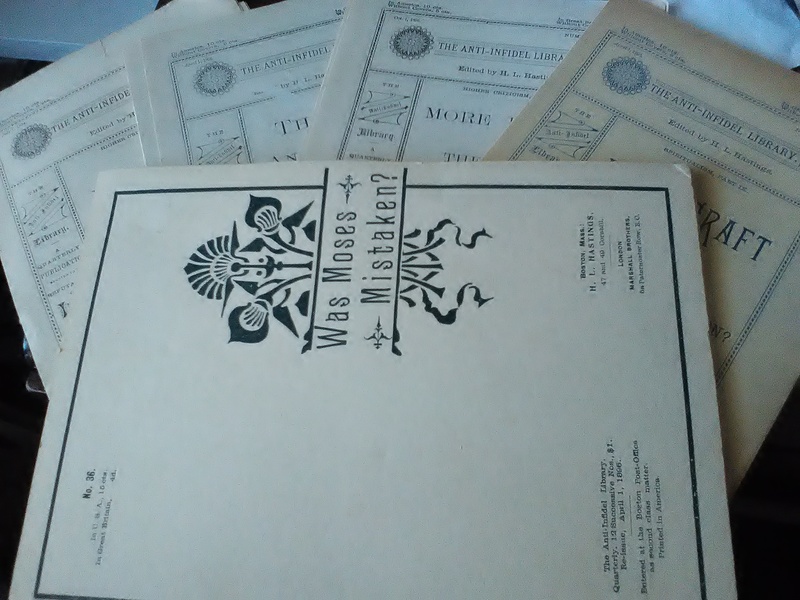 We think that you will enjoy and be benefited by today’s addition to the Jimmie Beller Memorial eLibrary: “Ingersoll’s Mistakes About Moses” by D.R. Dungan. Simply click the link below and read it online or save for later reading on your favorite device! The past couple days, we’ve made available booklets defending of the accuracy of the Biblical text. Today, we continue the same general theme, but this time with a slightly different slant to it. This book, like “The Corruptions of the New Testament” (from Monday) and “The Pentateuch: Its Origin and Authorship” (Tuesday), was written by H.L. Hastings, editor of “The Christian” newspaper and “The Anti-Infidel Library.” He was highly respected by people in different churches throughout the world for his clear writing on important topics. He also edited a songbook called “Songs of Pilgrimage: A Hymnal for the Churches of Christ” in which he argued that it cheapens psalms, hymns, and spiritual songs to accompany them with instruments. Can a Corn Stalk Count? Also included at the end of this booklet are some excerpts from some of Hasting’s other writings and works. So, take a few moments, if you will, and see what you think about this, the newest addition to the Jimmie Beller Memorial eLibrary. Click on the link to read it online or download it for reading on your own time. This week’s additions to the Jimmie Beller Memorial eLibrary all have to do with defending the Bible against the skeptics who make claims that it is uninspired and/or severely corrupted. 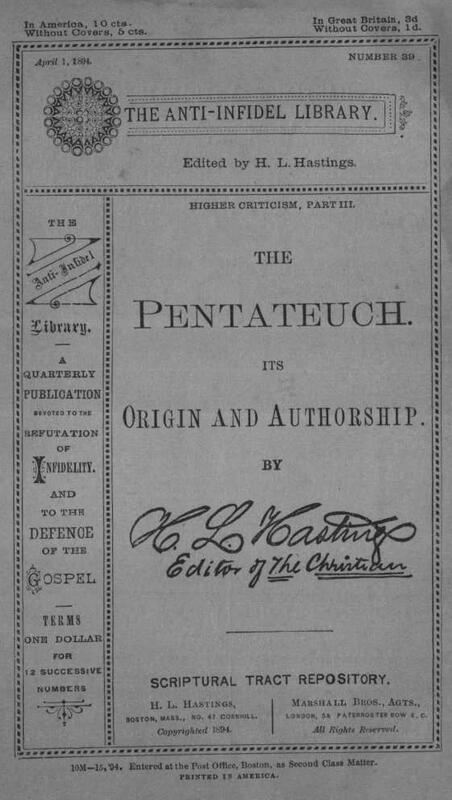 Back in the late 1800s, it was popular for atheists to go around making claims that the Pentateuch (the first five books of the Bible) was full of mistakes and corruptions, and wasn’t even written until many years after Moses was dead. By this, they tried to prove that it (1) wasn’t from God and that (2) it wasn’t written when/by whom it was claimed. In response to these speeches, several responses were written by different men from different church backgrounds. One such response is today’s free offering. Written by H.L. 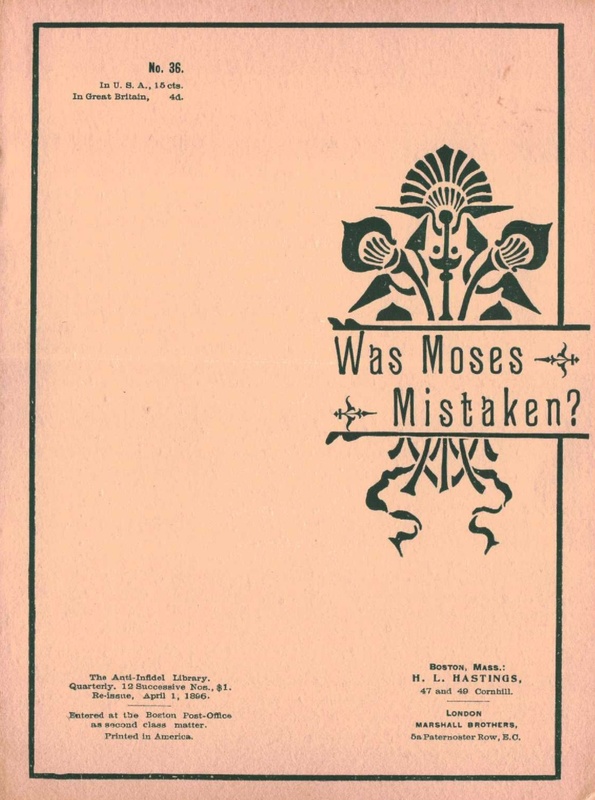 Hastings, editor of “The Christian” newspaper and the “Anti-Infidel Library,” this booklet contains several solid lines of evidence showing the divine origin of Genesis through Deuteronomy, and also spends a lengthy chapter showing that the claims of mistakes and corruptions are overblown. The Pentateuch: Its Origin and Authorship. One Independent Witness to the Authenticity and Great Antiquity of the Pentateuch. H.L. Hastings was a prolific writer in the late 1800s, with literally millions of his booklets being published. Most of them dealt with the topic of the reliability and inspiration of the Bible. He put out a regular publication called “The Christian,” and a series of booklets called “The Anti-Infidel Library.” Several of these booklets are on list to add to the Jimmie Beller Memorial eLibrary in the coming weeks. But for now, we’d like to present to you his book called “The Corruptions of the New Testament.” It shows that the claims of the skeptics are completely overblown when it comes to supposed “corruptions” of the New Testament text. How Old Is The English Bible?. Old Bibles In Other Languages. The Variations In Different Editions. Various Readings In The Sermon On The Mount. The Preservation Of The Manuscripts. No Record Of Apostles’ Death. What, Then, Are Our Conclusions?. The Testimony Of Origen On The Canon. The Muratorian Fragment On The Canon. The Earliest List Of The New Testament Books. The Disputed New Testament Books. The Epistle To The Hebrews. The Conclusion Of The Matter. To read this book, simply click the link below, or you can download it to save for later reading. Enjoy! It is Wednesday, which means that saints will be gathering somewhere near you to study the Bible and sing praises to the Lord God. But some people might wonder, “Why do you believe the Bible?” George DeHoff wrote a book specifically to answer that question. It serves as a great brief guide to the inspiration of the Bible. To download it FREE, just click the link below. A reminder–we really appreciate each and every one of you for taking the time to read our posts and for sharing them with others! Since we’re on our way to Canada, we thought we’d make this week’s first post Canada-related. In 1942, a man named Reuben Butchart wrote a booklet entitled “A Primer of Disciple History in Canada.” In it, he shows how the Restoration Movement moved into the North Country and spread. In short, it’s a brief history of the church of Christ in Canada. We appreciate each and every one of you for taking the time to read our posts and sharing them with others.